Summer just begs for tropical flavors. Like the Harry Nilsson song says, "She put the lime in the coconut and drank them both up." When you throw in a mango you have a party. I love lime, coconut, and mango. So, I thought they just might make a delectable macaron. Turns out they do. These petit treats are an explosion of tropical flavors that make them difficult to eat just one. But don't worry because the recipe makes a lot. I have been slightly obsessed with macarons lately. Different taste combinations seem to fill my mind constantly. French macarons can be a little intimidating, but with a few tricks and a little practice they really aren't hard to make. Macarons freeze quite well. Just allow them to sit for a few minutes to soften before serving. That is the hard part in our house. I like to keep a tin in the freezer for a little afternoon treat. Although the tin doesn't stay full for long. elasticity and rise without exploding and causing the shells to crack. investment as you will find you use them in place of parchment paper for better results. 4. Open the oven door once or twice during baking to let out steam and prevent cracking. 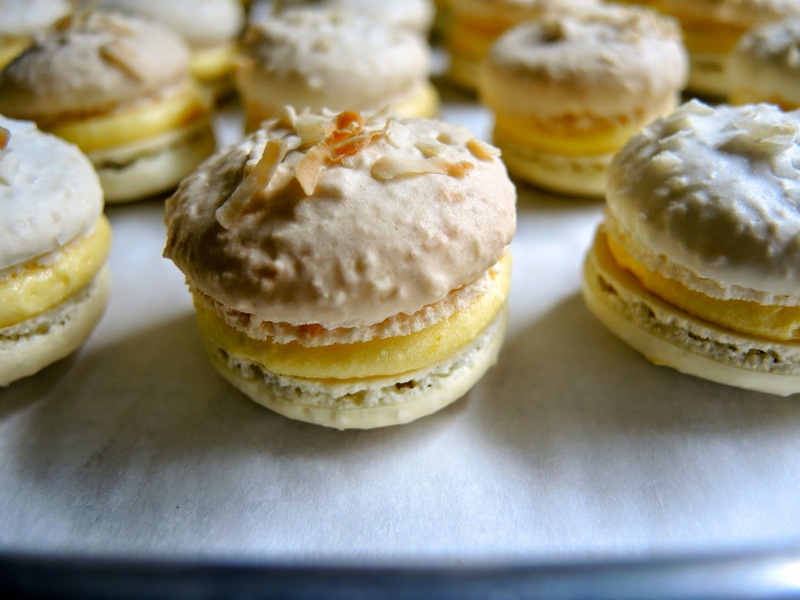 This recipe is rather long because you have lime macaron shells, coconut macaron shells, and mango lime cream to make. But each part can be done separately and then assembled at a later time. 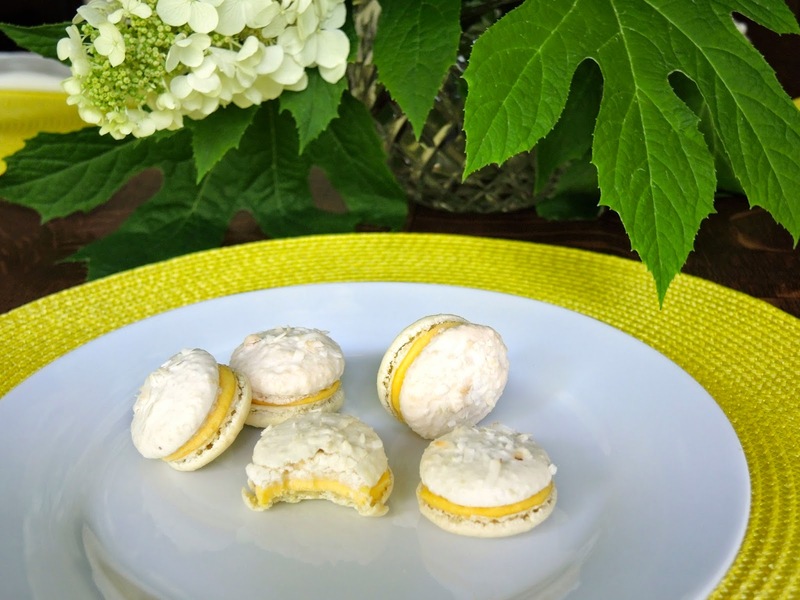 The macarons shells can be stored in a tin at room temperature for a few days or for several days in the freezer. The mango lime cream can be made a day or two ahead as well. Once assembled the macarons need to rest in the refrigerator for several hours. They will keep for a few days in the refrigerator. Freeze them for longer storage. The lime macaron recipe makes about 3 trays of 1 1/2 inch (4 cm) macarons. 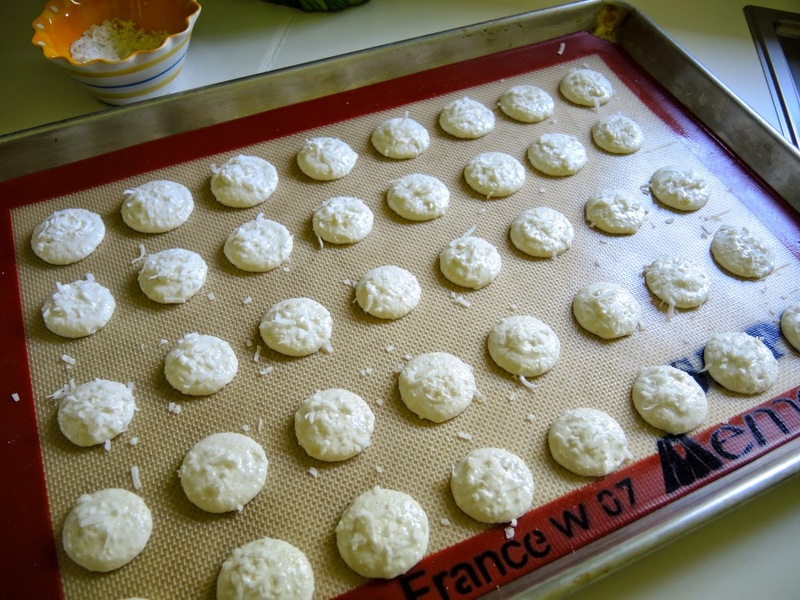 The coconut macaron recipe makes about 4 trays of the same size so you will probably have left over coconut macarons. But they are quite tasty on their own or sandwiched with chocolate ganache or Nutella. Line 3 baking sheets with silicone baking mats or parchment paper. Prepare a pastry bag with a large plain tip. In a bowl large enough to add the meringue to sift together the ground almonds and confectioner's sugar. 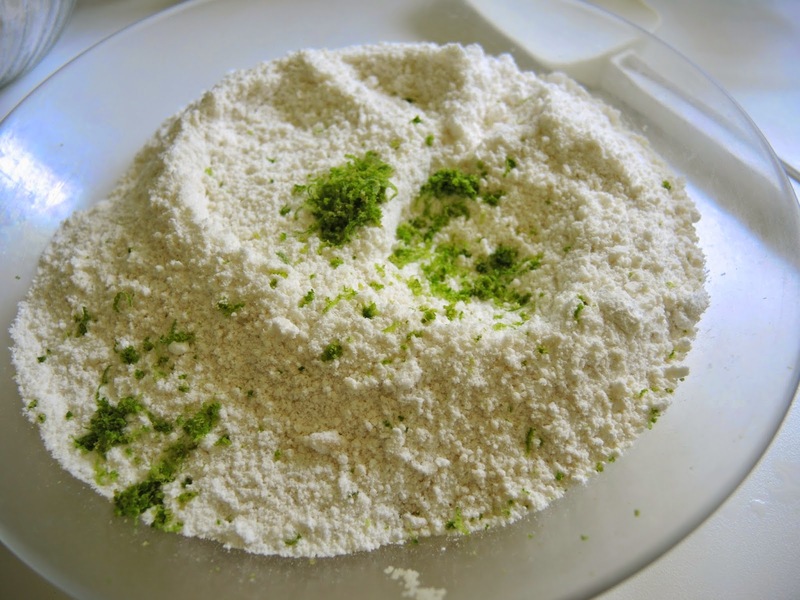 Add the lime zest and incorporate into the almonds and confectioner's sugar by rubbing the mixture between your fingers to release the fragrant oils of the lime zest. Pour 3 egg whites over the mixture and set aside. Do not stir. 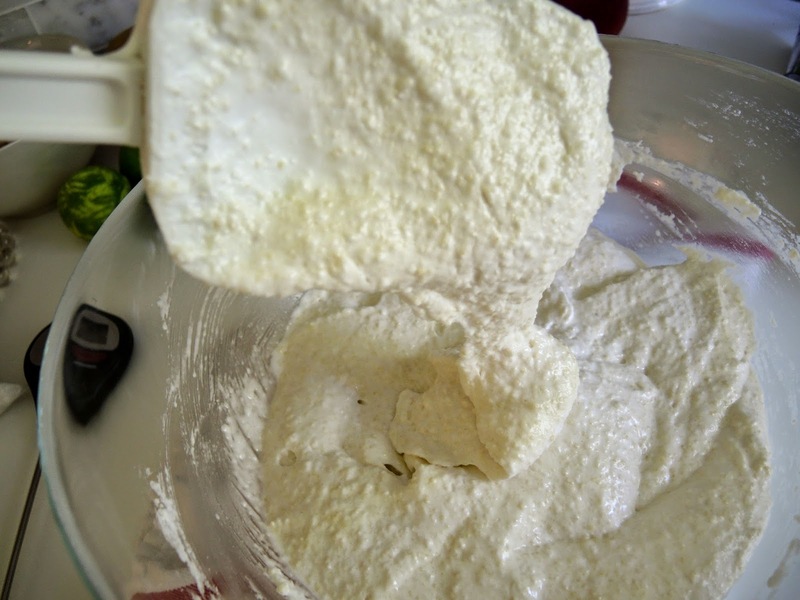 Put the other 3 egg whites in the bowl of a standing mixer with a whisk attachment. Combine the granulated sugar and water in a small saucepan. Stir to combine. Bring to a boil and continue to cook until a thermometer reaches 110℃ (230℉). 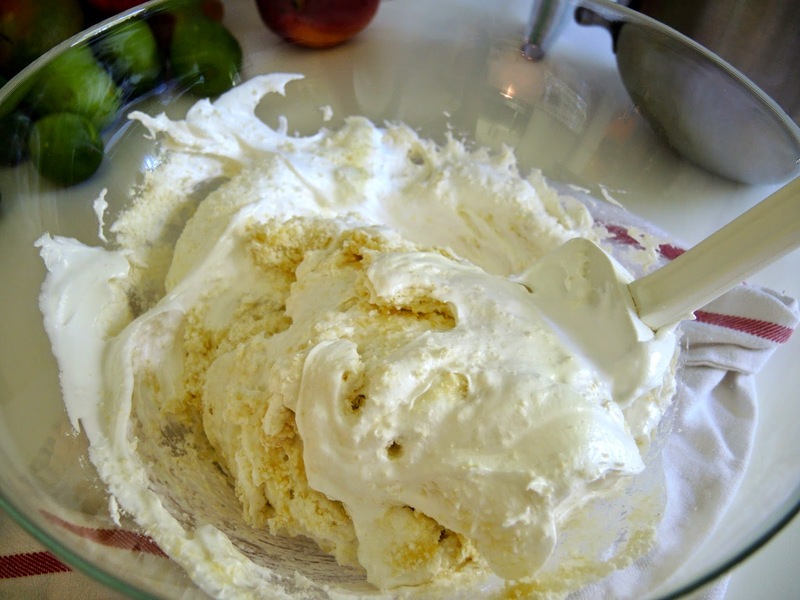 While the sugar mixture is reaching temperature whip the egg whites until stiff peaks form. Turn the machine off and let them sit until the sugar mixture is ready. When the temperature reaches 110℃ (230℉) turn the mixer back on. With the mixer on medium speed slowly add the sugar syrup to the egg whites continue to beat until the egg whites are stiff and glossy. 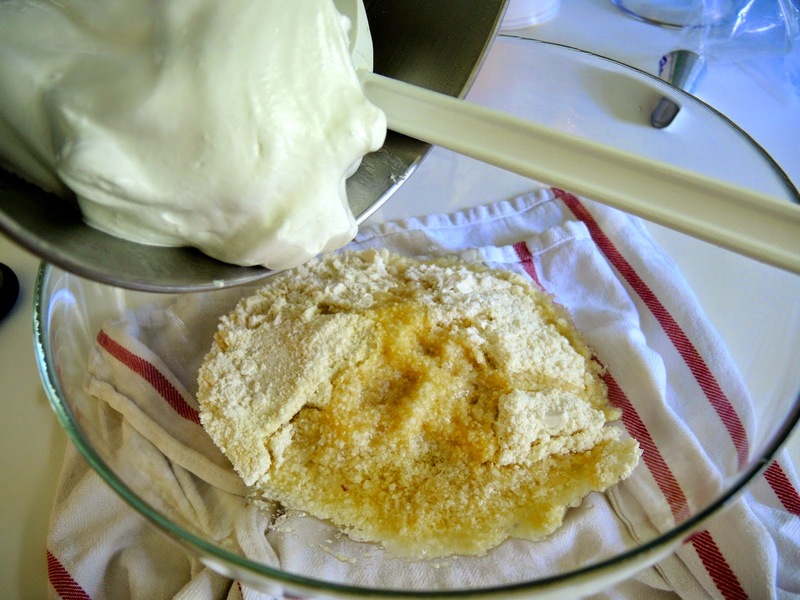 Allow the meringue to cool slightly then fold it into the almond mixture. Continue to fold pressing the batter against the bowl to remove some of the air and slightly deflate the batter. The batter should look like slightly runny cake batter. Put the batter in the prepared pastry bag and pipe neat rounds about 1 1/2 inches (4 cm) across. 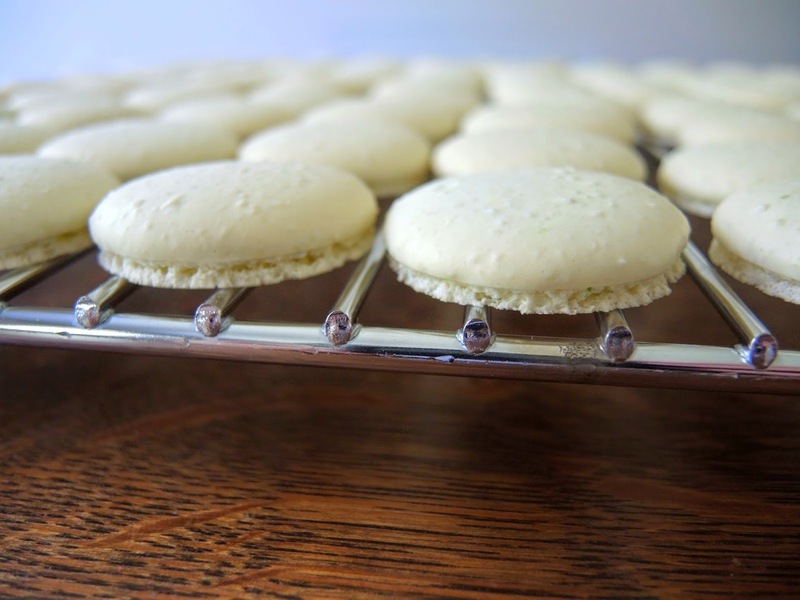 Whack each pan once or twice on the counter to flatten the macarons slightly and remove air bubbles. Allow macarons to rest 20-30 minutes to develop a skin so they don't crack when they bake. Touch the top to check. It should feel dry and not sticky. Bake one sheet at a time in the lower third of the oven. Bake for 10-12 minutes. To release any steam that might crack the shells open the oven door twice during baking. The first time after 4 minutes, then again after four more minutes. By then the feet should be formed. The macarons will look dry on top when finished. Remove from the oven. Carefully move the silicone baking mat or parchment paper onto a cooling rack. If you leave the macarons on the hot pans they will continue to bake. When cool remove from the silicone baking mats or parchment paper. Store in a tin until ready to fill. Line 4 baking sheets with silicone baking mats or parchment paper. Prepare a pastry bag with a large plain tip. Put the ground almonds, confectioner's sugar and coconut in a food processor. Pulse several times to combine and grind the coconut slightly. Move to a bowl large enough to add the meringue to. Pour 3 egg whites over the mixture and set aside. Do not stir. Put the batter in the prepared pastry bag and pipe neat rounds about 1 1/2 inches (4 cm) across. 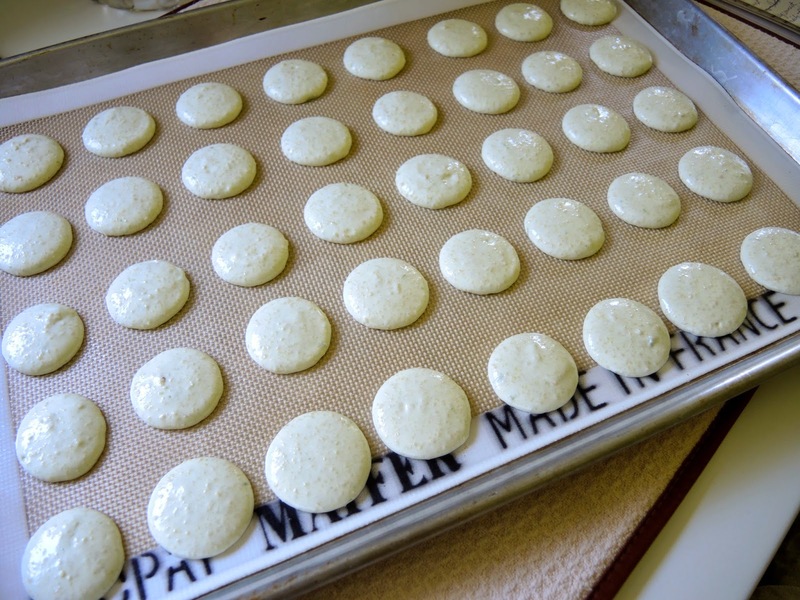 Whack each pan once or twice on the counter to flatten the macarons slightly and remove air bubbles. 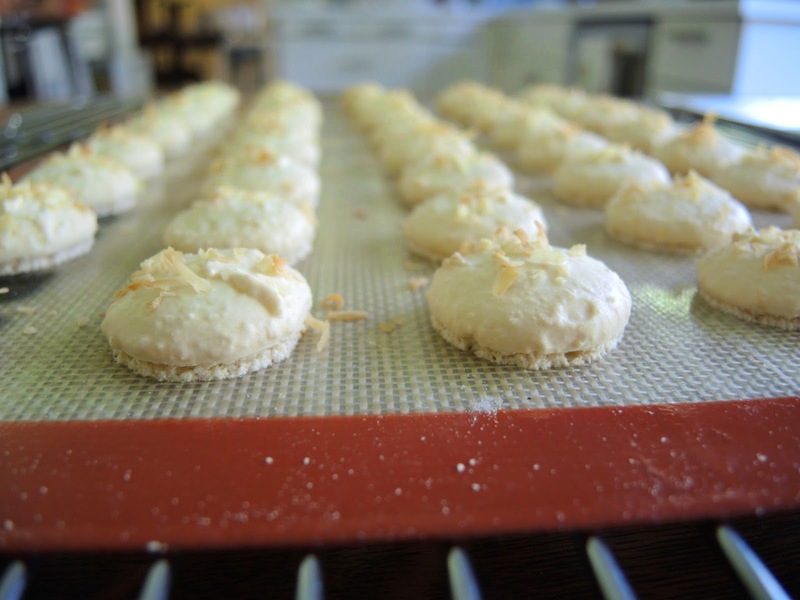 Sprinkle macarons with additional unsweetened flaked coconut before they are allowed to rest and develop a skin. Allow macarons to rest 20-30 minutes to develop a skin so they don't crack when they bake. Touch the top to check. It should feel dry and not sticky. Bake one sheet at a time in the lower third of the oven. Bake for 10-12 minutes. To release any steam that might crack the shells open the oven door twice during baking. The first time after 4 minutes, then again after four more minutes. By then the feet should be formed. The macarons will look dry on top when finished and the coconut will be slightly toasted. 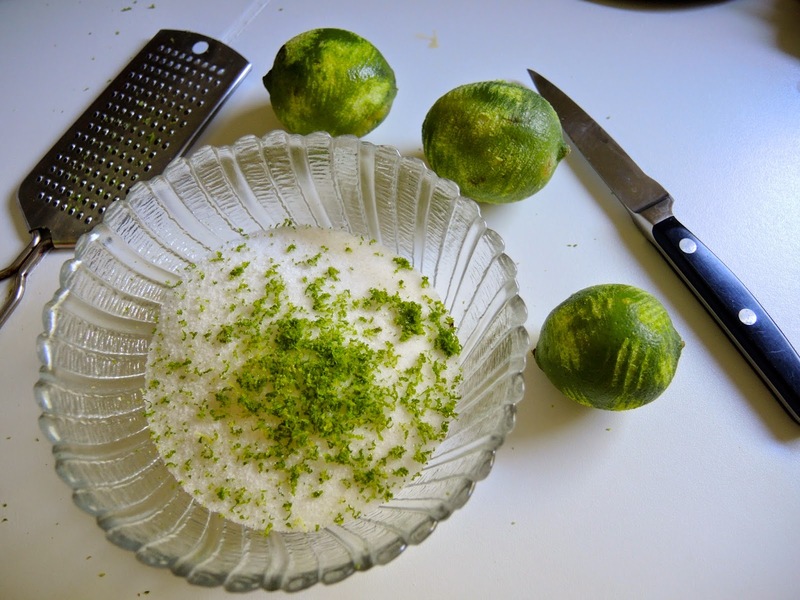 Combine the sugar and lime zest in a bowl and rub the mixture between your fingers to release the oils from the lime zest. In a stainless steel bowl whisk together the egg yolks and whole eggs. Add the sugar/lime mixture and whisk to combine. Stir in the lime juice and mango purée. Fill a medium saucepan 1/3 full of water and bring to a gentle boil. Set the bowl over the pan of gently boiling water. Don't let the boiling water touch the bottom of the bowl. Whisk continuously until very thick, about 10 minutes. Remove from the heat and strain through a fine mesh strainer into a glass container. Cover with plastic wrap pressed to the surface of the mixture. Refrigerate until very cold. 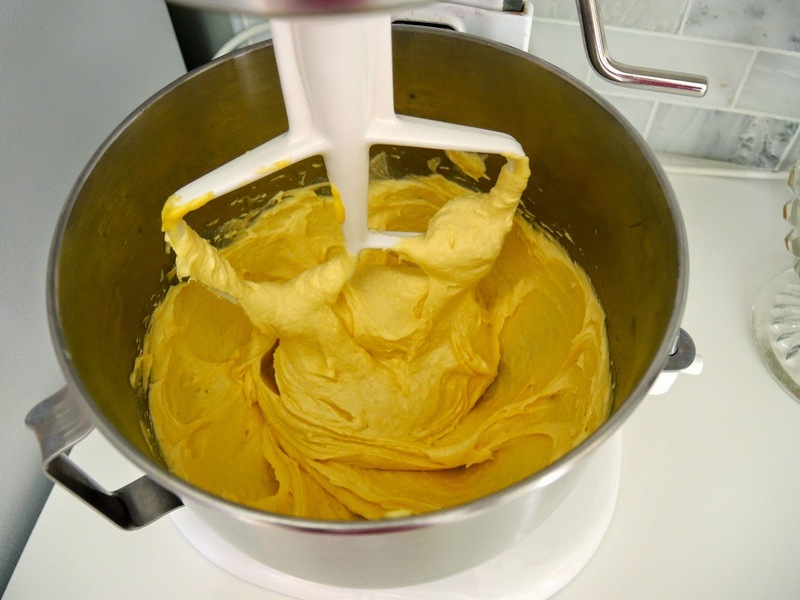 In the bowl of a standing mixer with a paddle attachment beat the butter for 10 minutes until very light and fluffy. 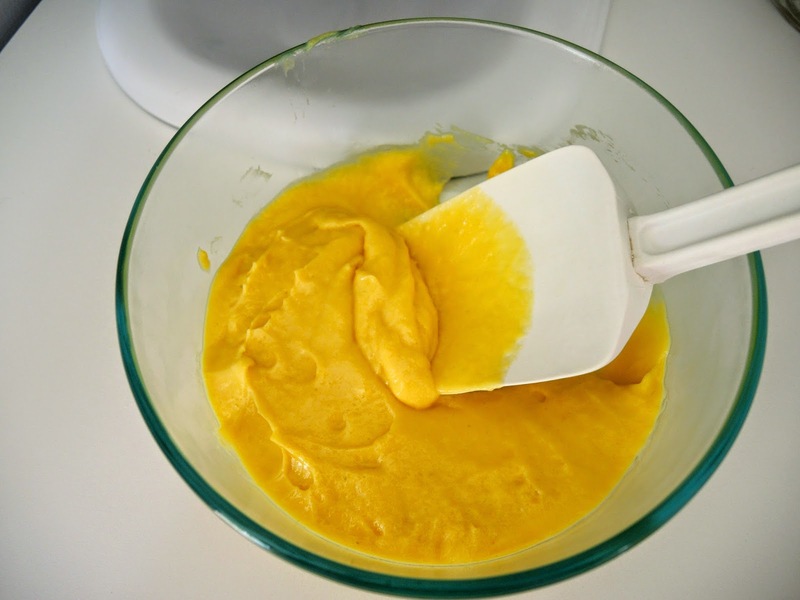 Add the mango lime cream a little at a time beating until the mixture is perfectly smooth. Put the mixture in a piping bag fitted with a large plain tip. 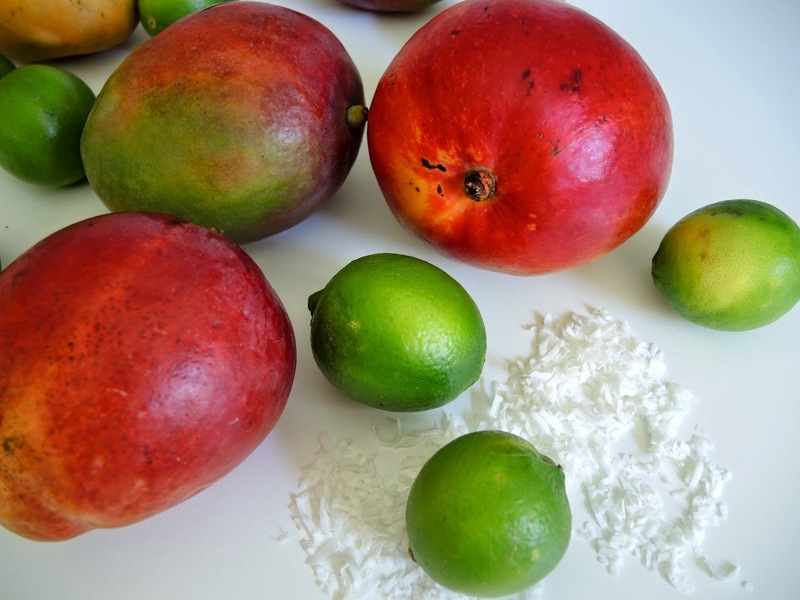 Pipe a generous amount of mango lime cream on a lime or coconut shell top with the opposite shell. 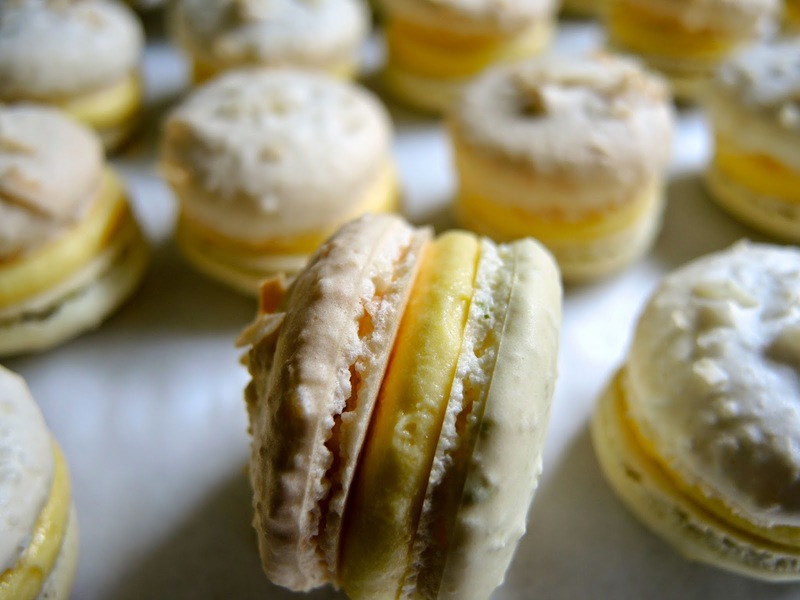 Allow the macarons to sit in the refrigerator for several hours. Remove just before serving. Left over macarons can be stored in an airtight container for 2-3 days or freeze for longer storage from 2 weeks to a month. If frozen allow to come to room temperature before serving.